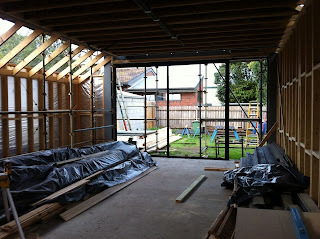 We are now halfway through the build. 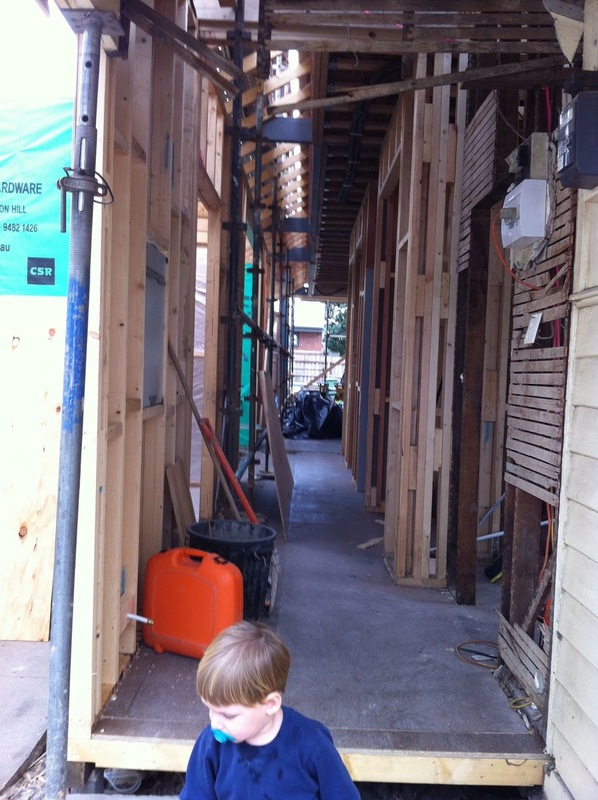 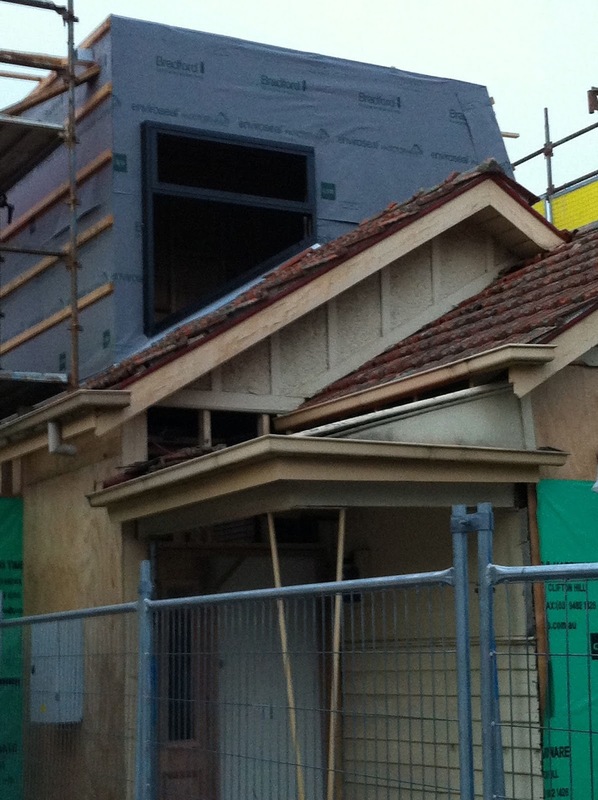 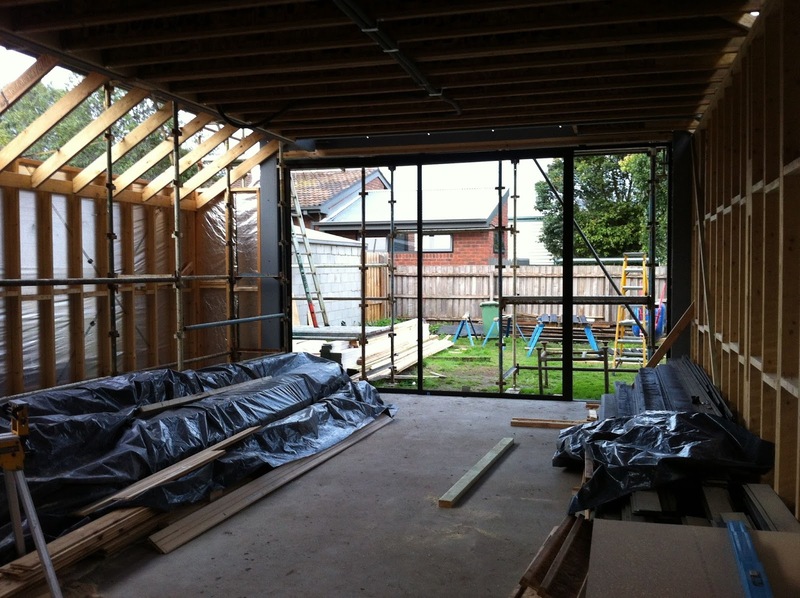 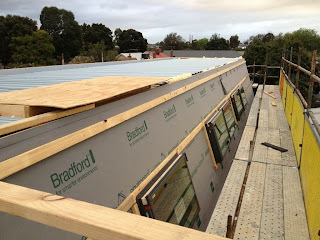 It was a week of cladding and hebel walls. 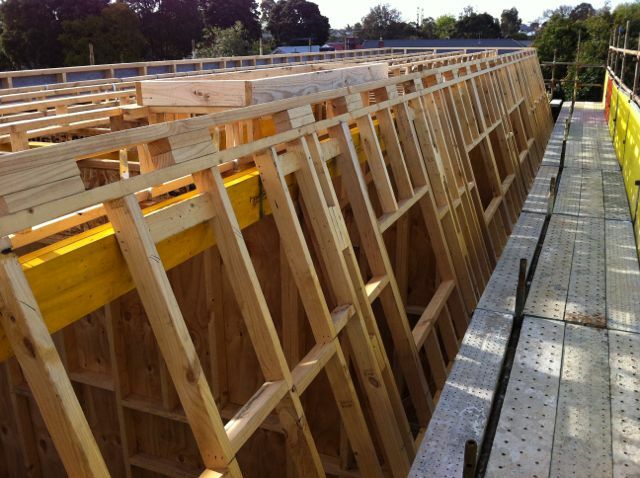 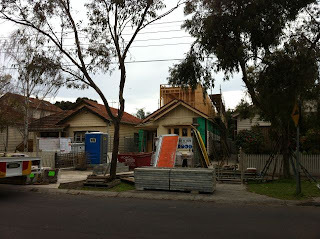 Hebel walls went up on the boundary walls. A couple of full day's staining of timber, and it is finally all done. 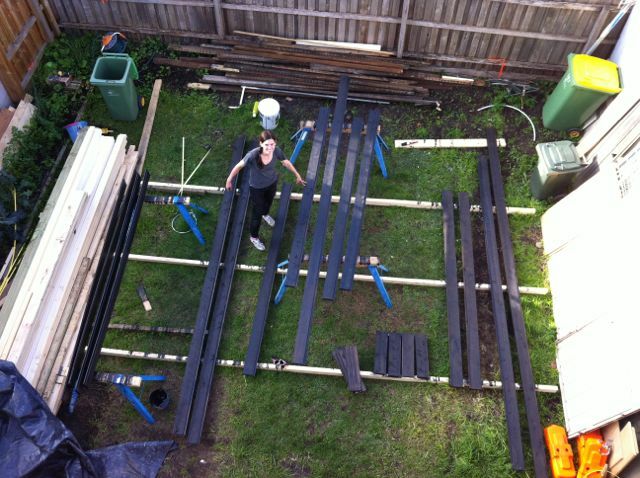 Exhausting yet satisfying. 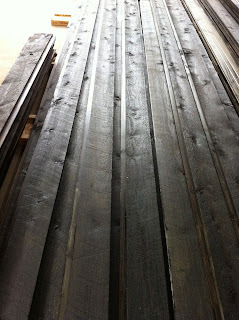 All 12,000 lineal metres of it - front back, sides, ends, wow. 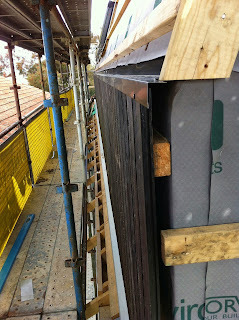 Flashings in black arrived for clad upper walls. 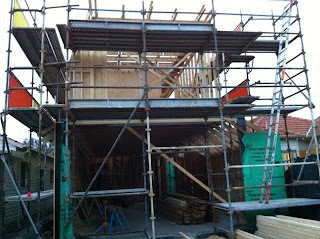 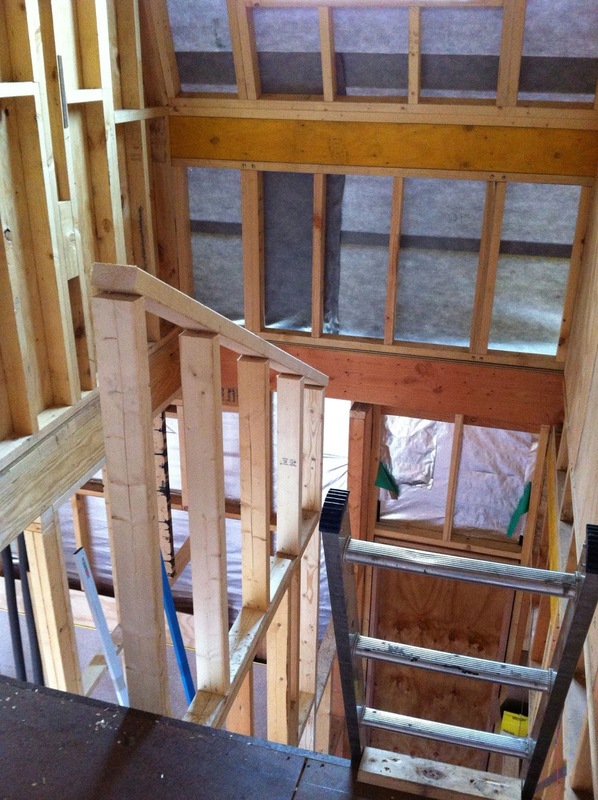 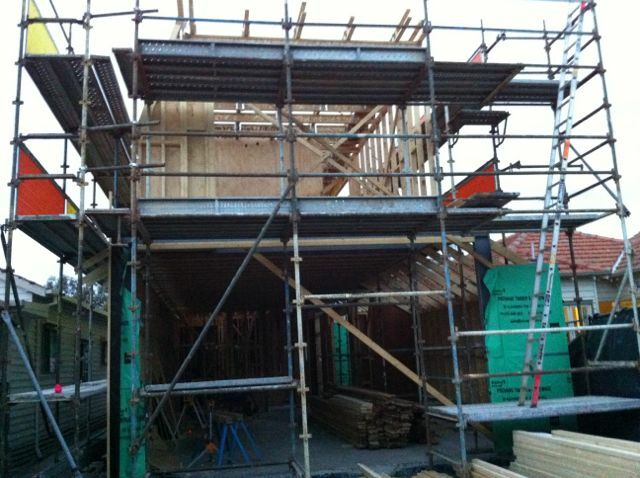 Timber cladding of upper level is progressing. Lovely to see the front upper facade all clad. Weatherboards on eastern ground floor now completed too. 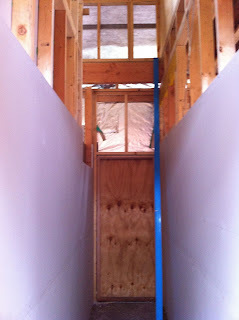 Progressing! 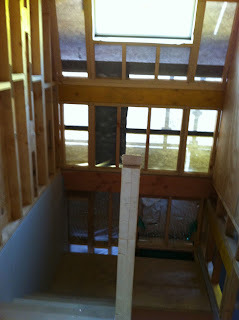 Main bedroom with no front wall! 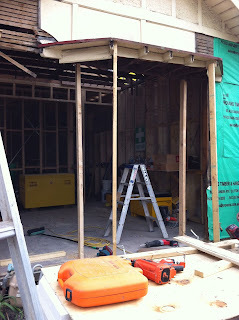 New frame on main bedroom is up and old window is out, all wrapped up so noone really knows! We seemed to have made lots of decisions this week! 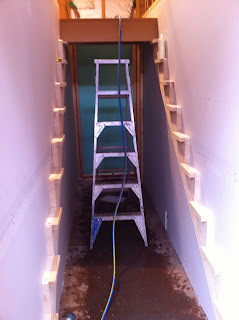 Another bath sourced, the original one returned. 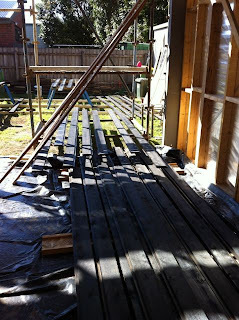 Strip drains picked out. 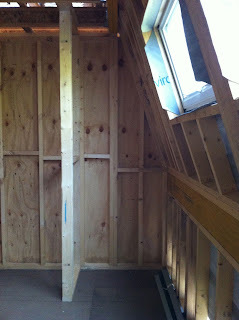 Air con linear slot issue thought through. 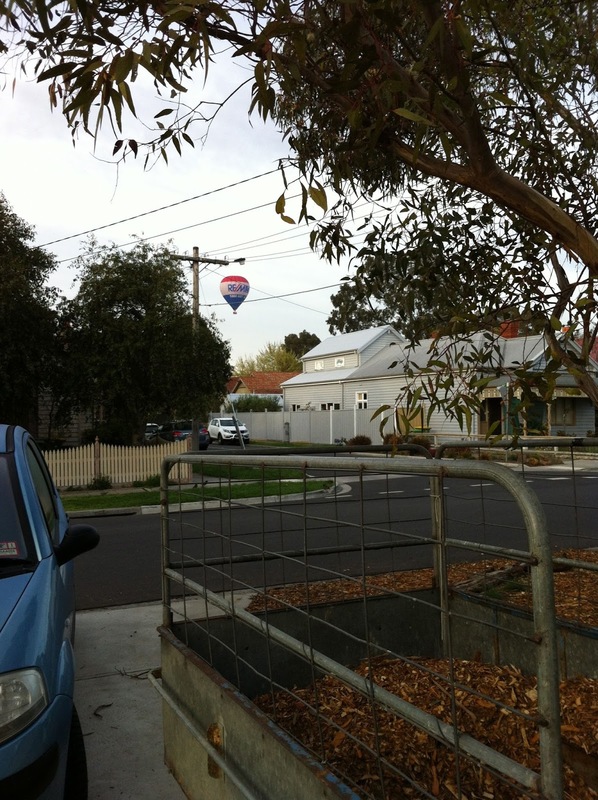 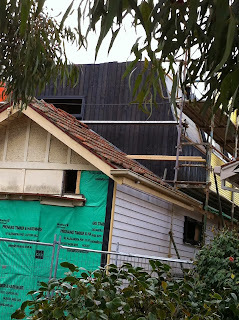 Profile of weatherboards sorted. 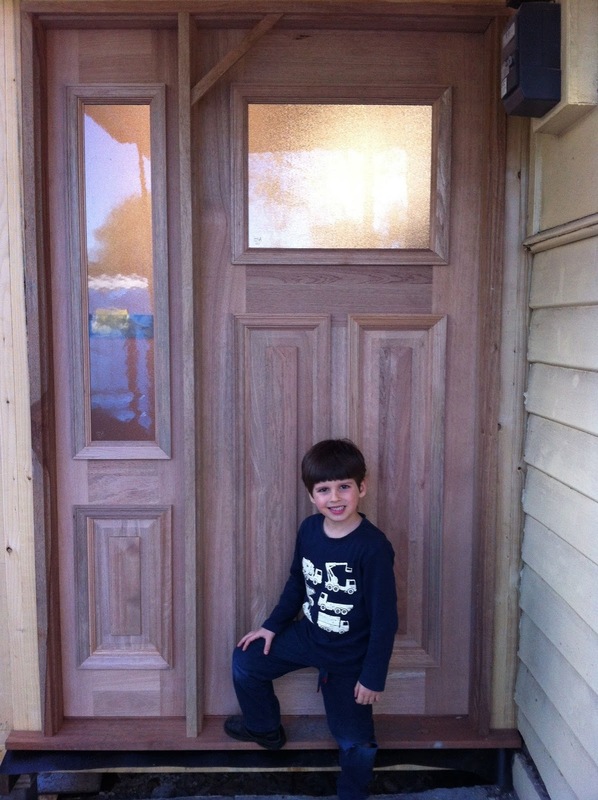 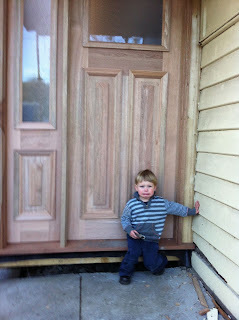 New front door style, with side light, type of glass insert - all sorted. 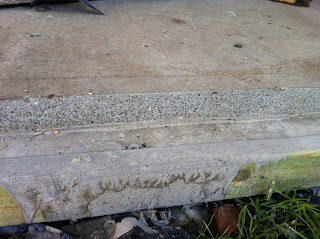 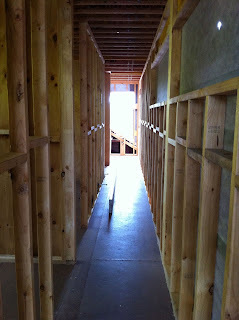 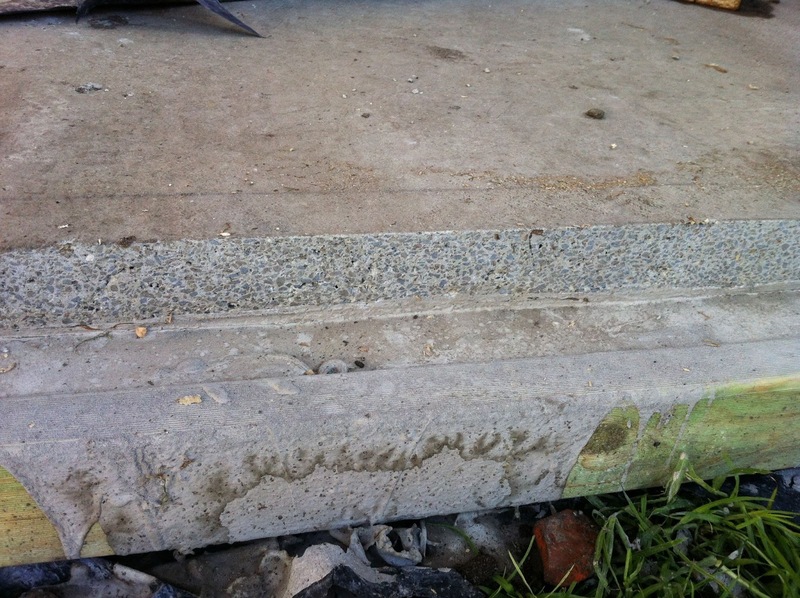 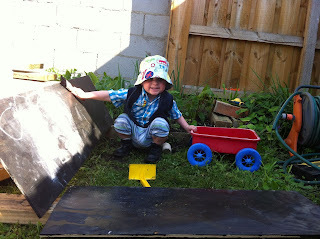 The remainder of the eaves on the ground level were finished, no mean feat. 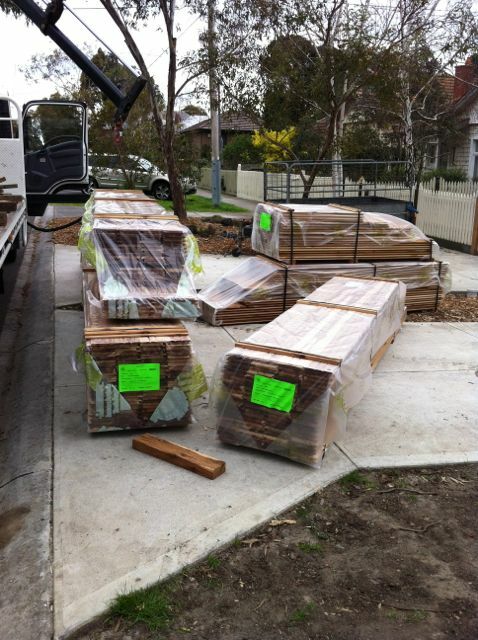 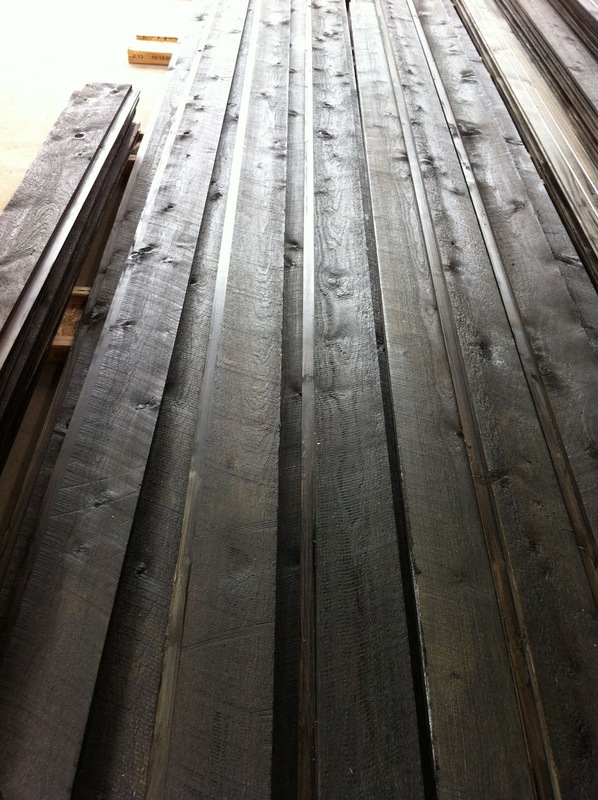 Frencham Cypress cladding arrived to site, the same day the scaffold arrived! 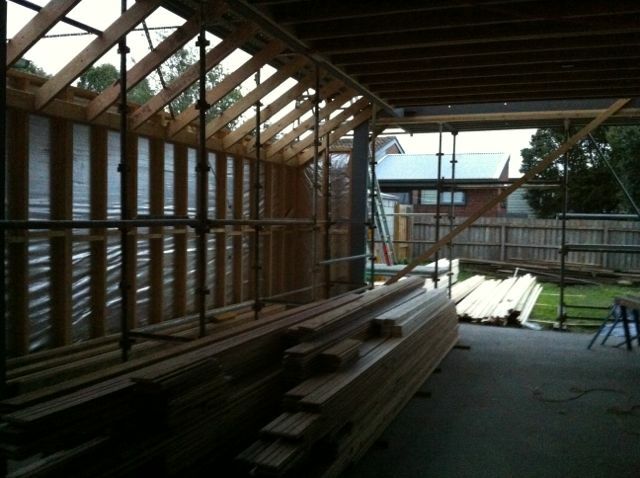 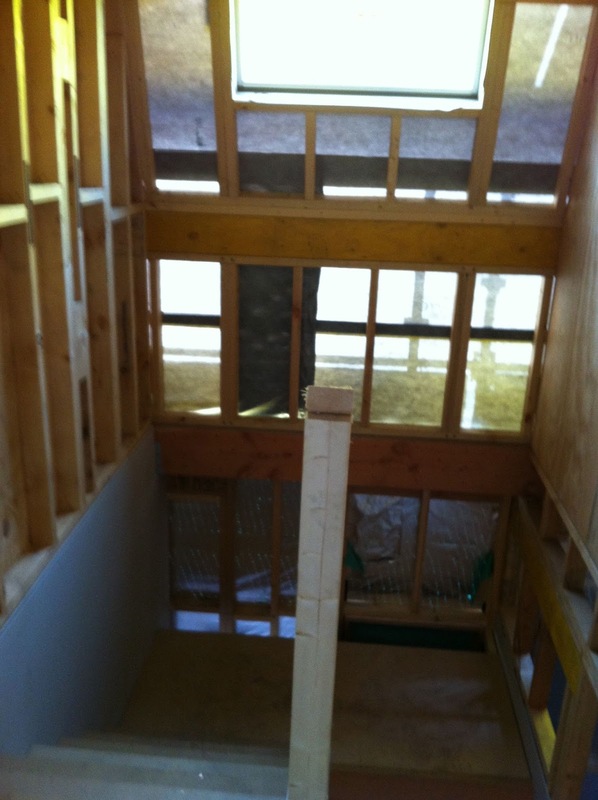 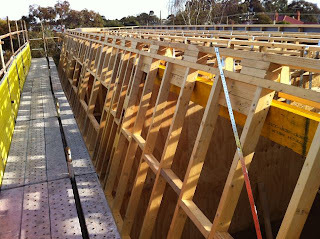 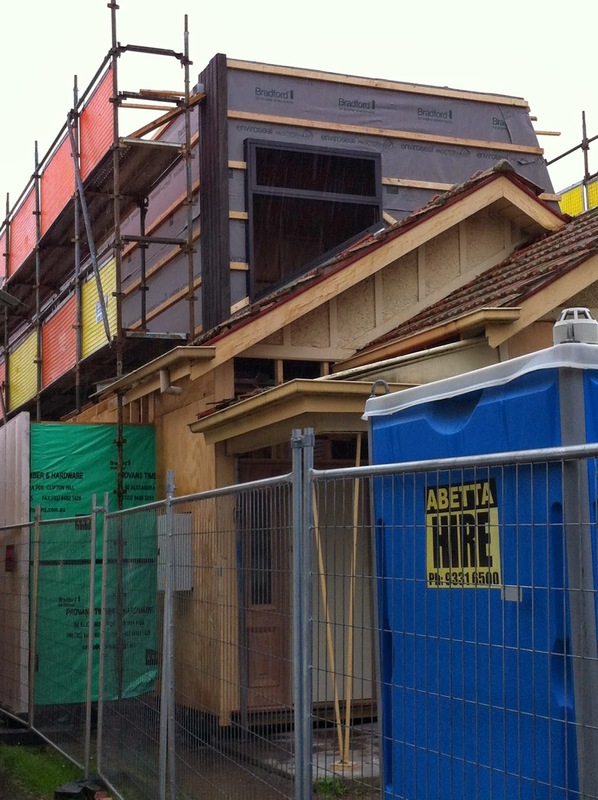 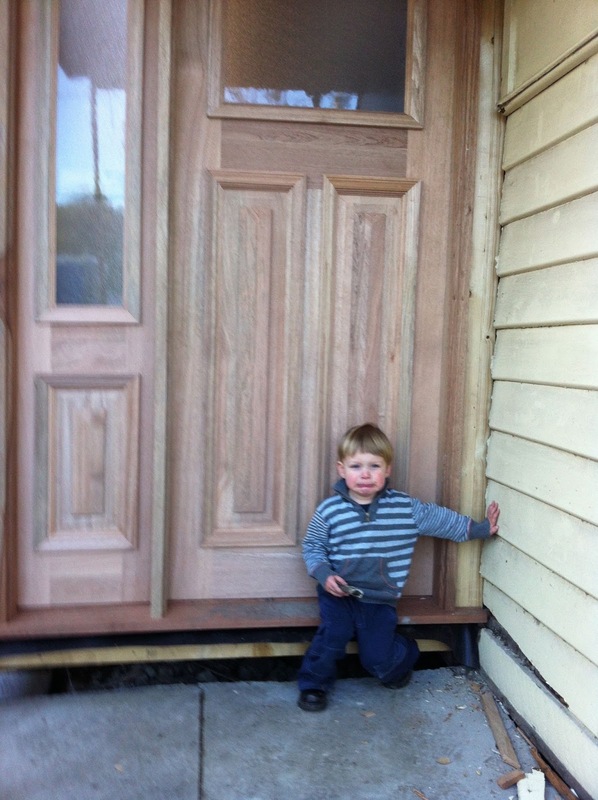 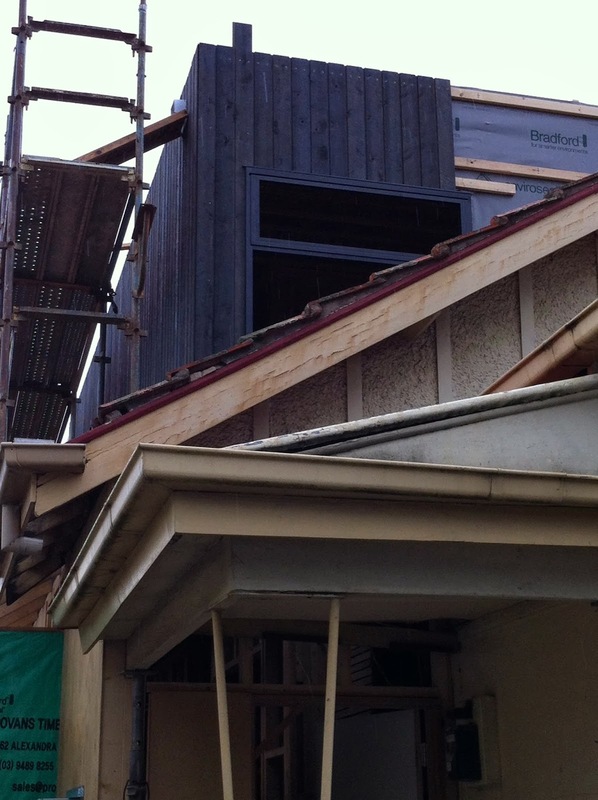 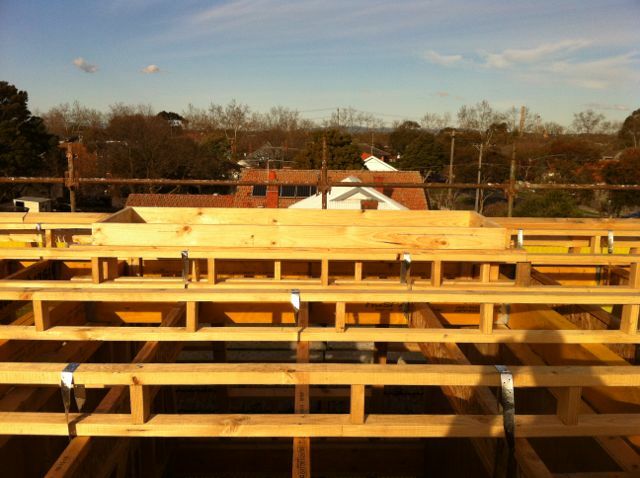 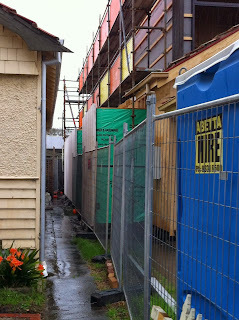 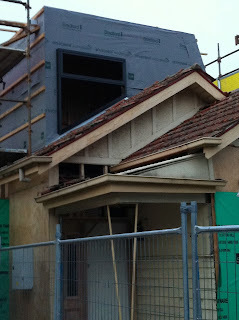 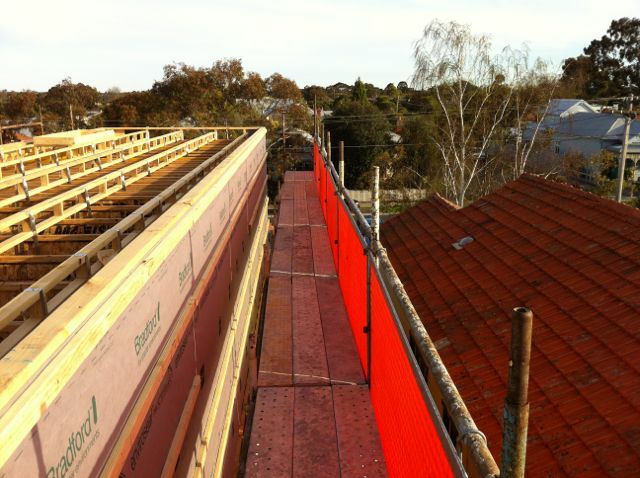 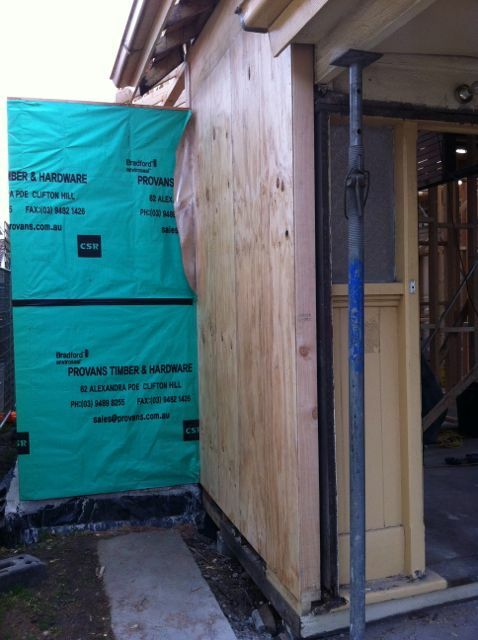 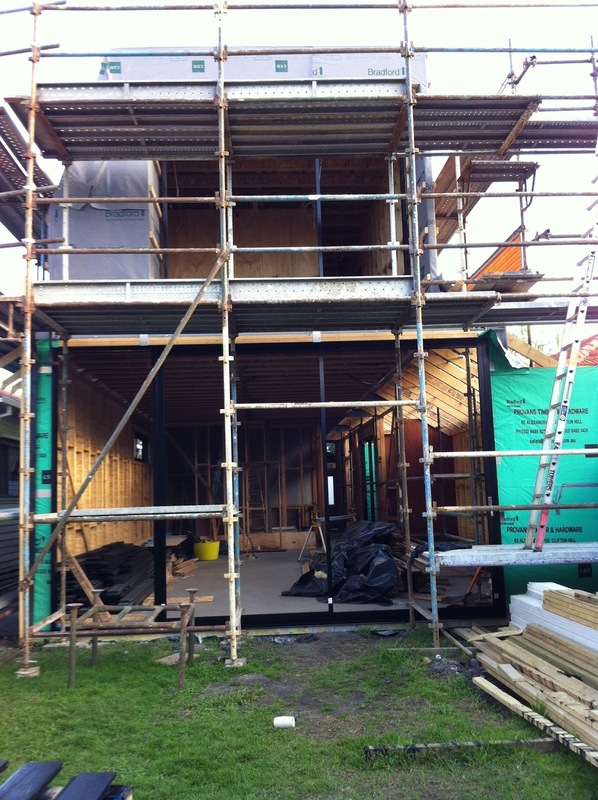 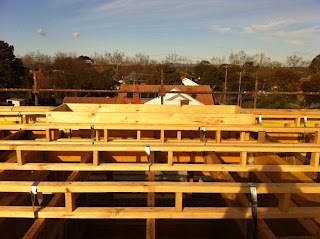 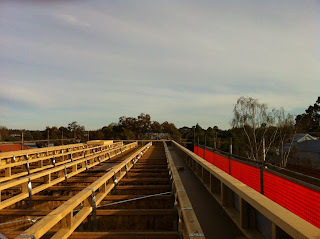 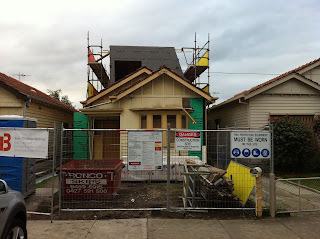 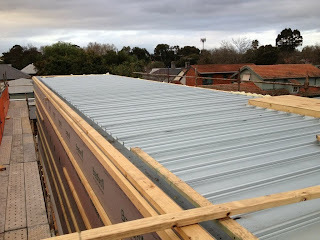 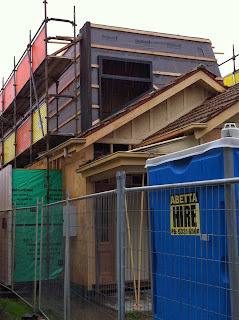 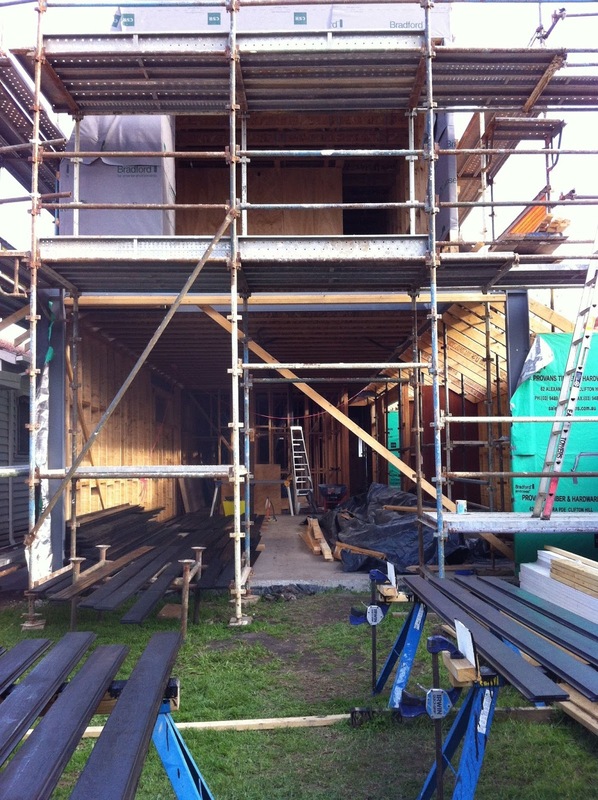 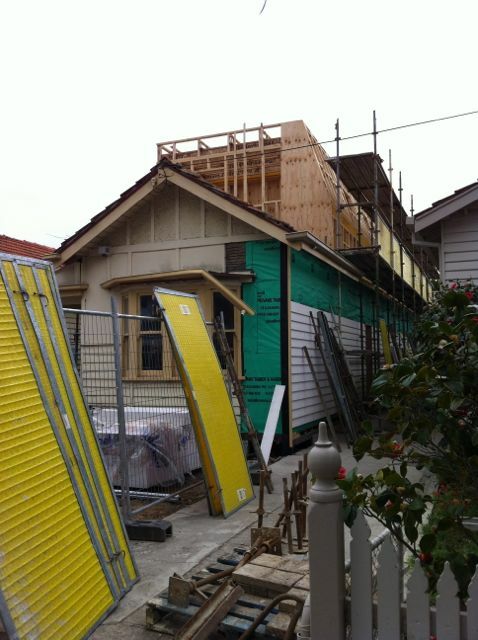 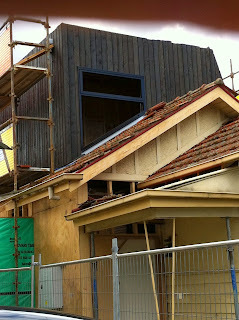 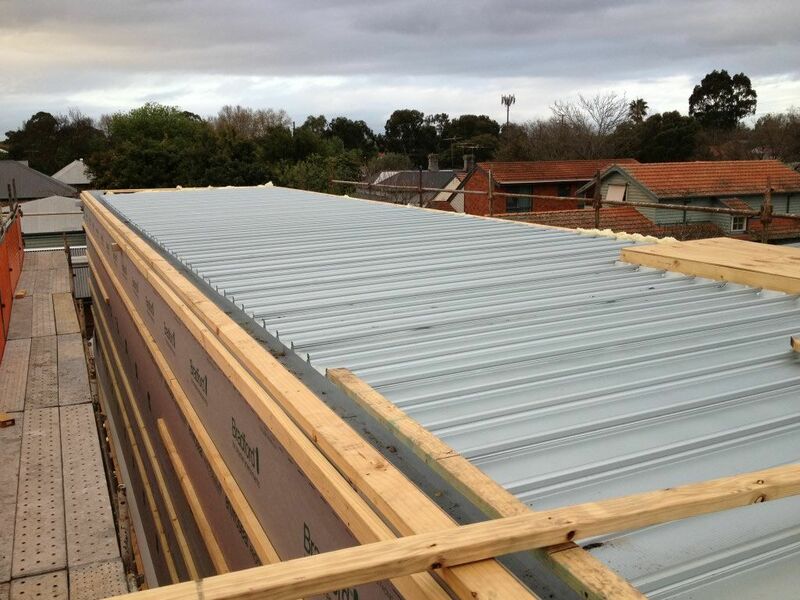 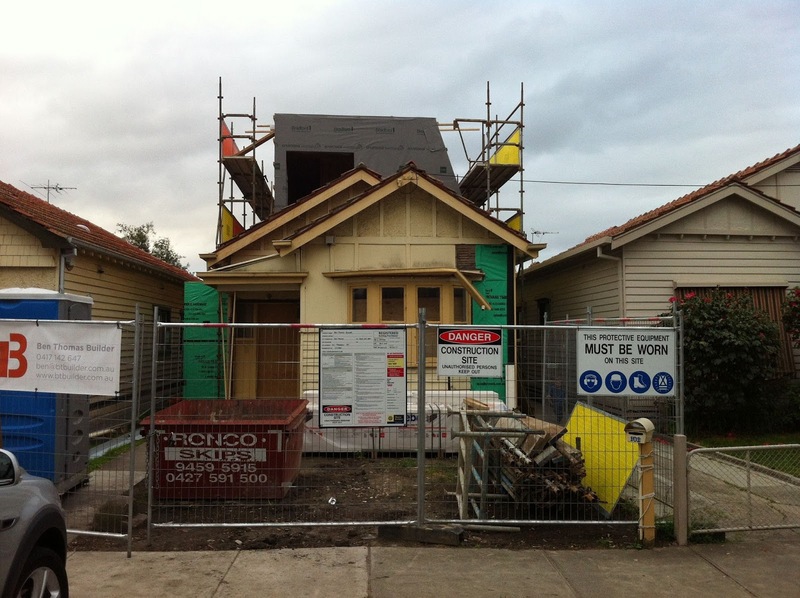 The weatherboards on the ground floor eastern side were installed, just before the scaffold arrived, to window height. 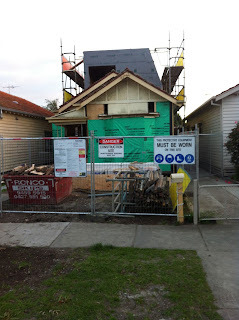 Our main bedroom weatherboards and linings came off, and yes the front of the house is almost completely rotted through at the base, could almost push it over! So, a new frame for the front of the house is in order. 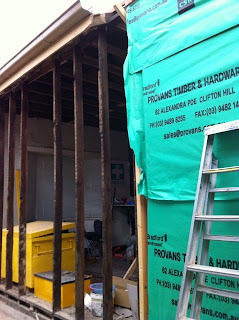 Number of original timbers which will remain after the reno - not many! 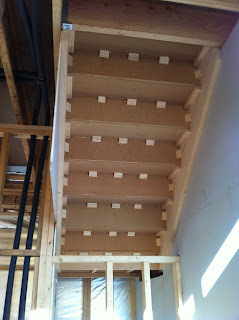 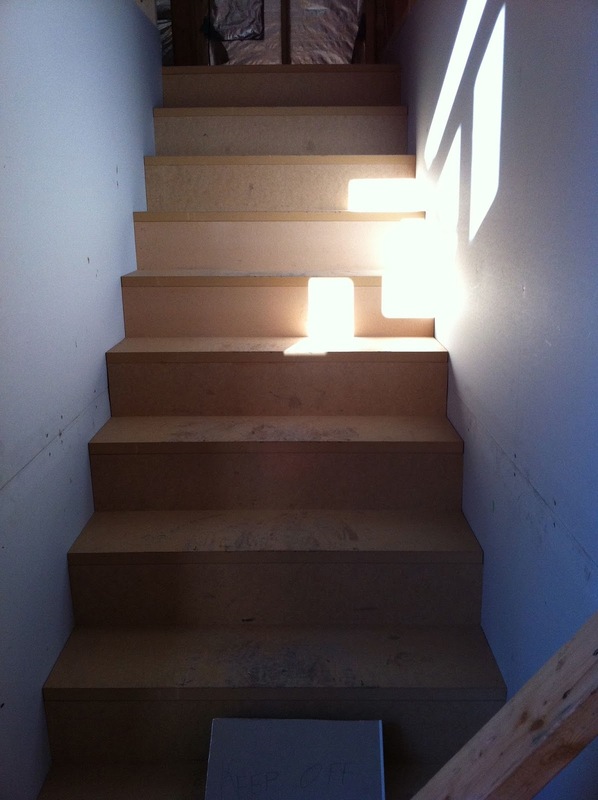 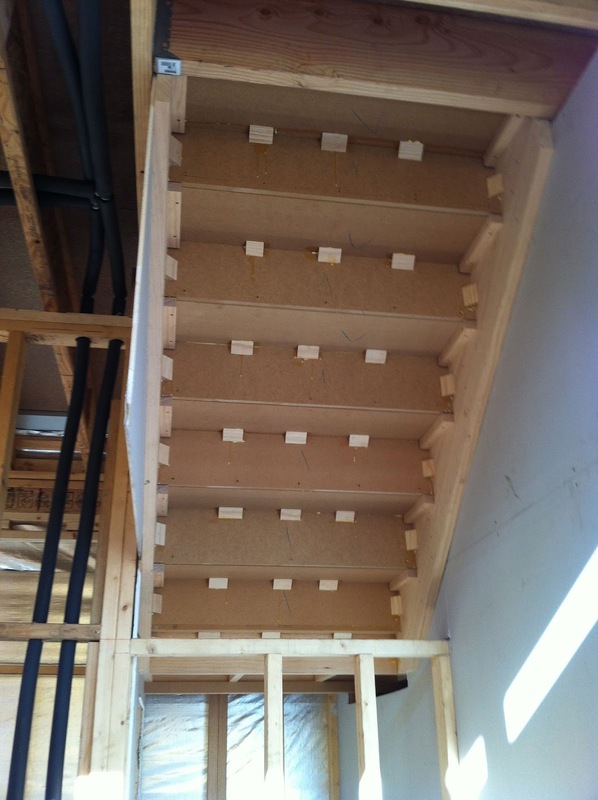 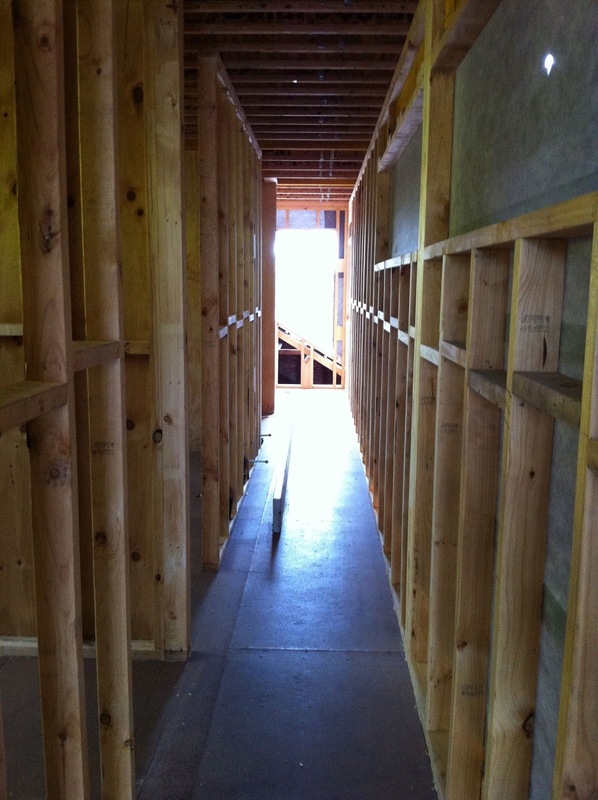 Builders put in extra bracing this week, in the form of plywood to address some engineering issues. 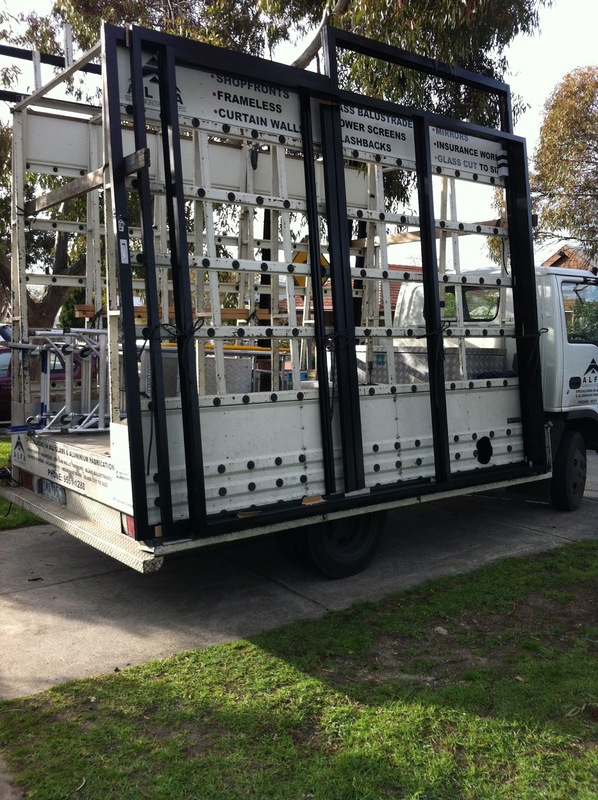 Hebel power panel arrived and ready to go up on the two boundary walls, which will be rendered. 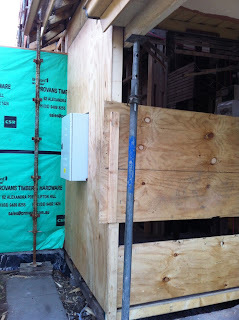 Some insulation has also arrived to site. 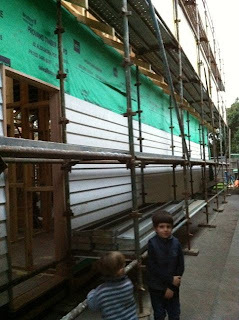 Vapour barrier sheeting has gone up on western side of first floor. 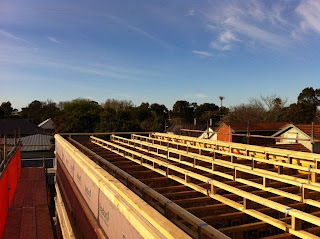 Roof plumbing and velux windows are imminent. 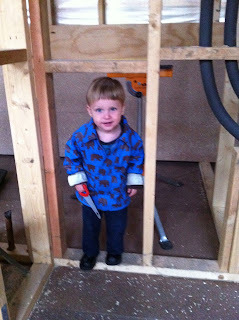 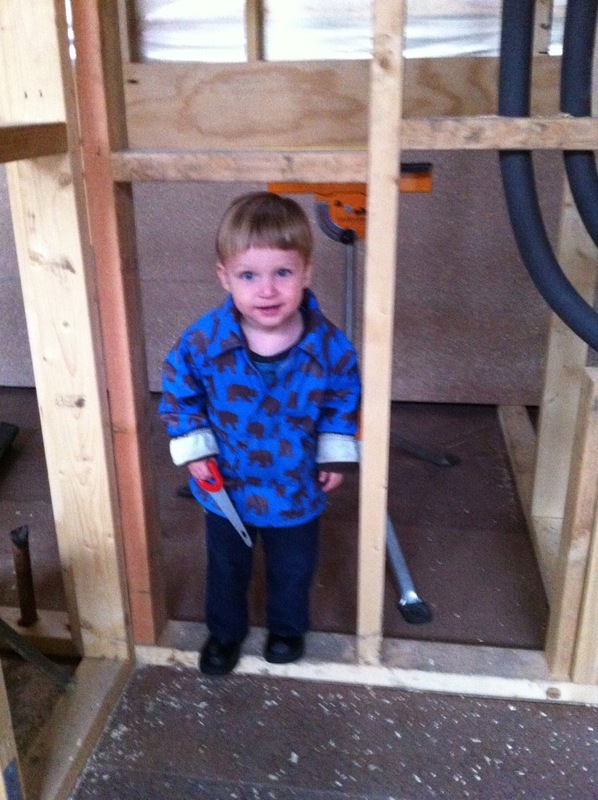 Plumber spent Saturday roughing in the remainder of the hydronic for the first floor. 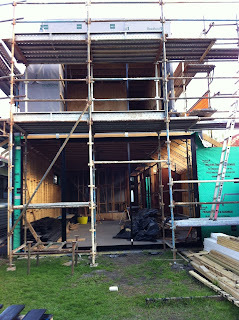 I spent Saturday and some of Sunday starting to stain the external cypress cladding - very time consuming. I like the finish. 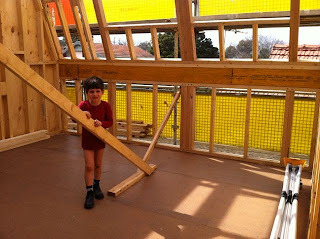 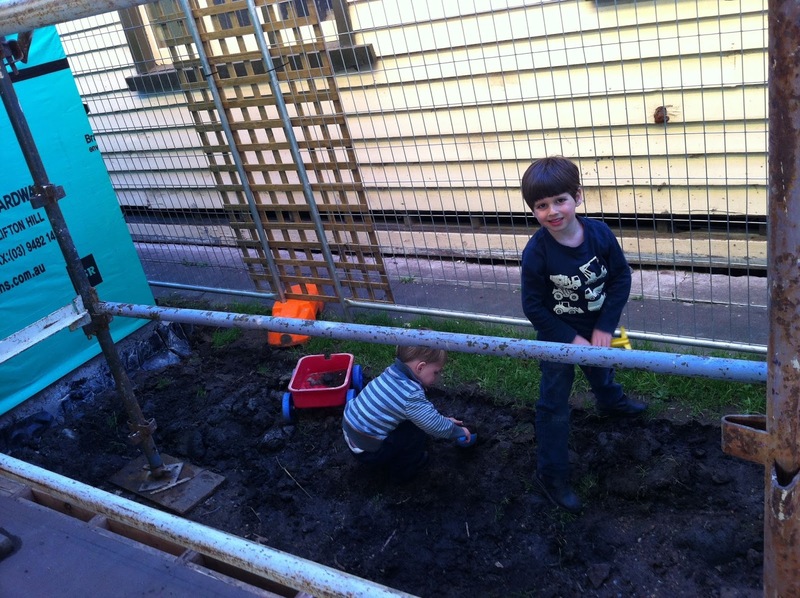 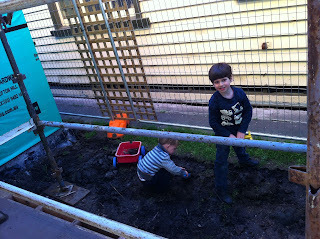 W helped me out on Sunday, and spent alot of time bounding around the lower levels of the scaffold in his robot undies with work boots - the weather was lovely. We went up to his bedroom on the first floor together, he is very excited. 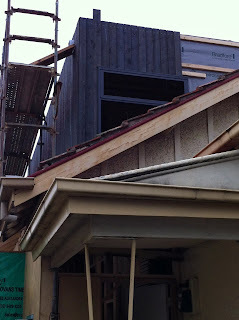 Hope the charcoal will look good on the first level with the black satin aluminium windows and doors. Slight fatigue at the end of week 9! 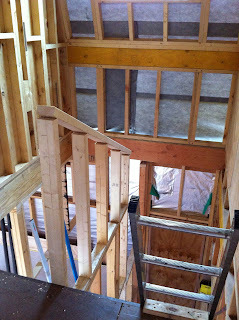 Main bedroom without eastern wall!